“How is your hunger?” Marita greets you. For Zimbabweans, hit by drought, failed crops and no food, the answer is almost always “bad”. Marita, 28 years old, lives in a rural part in the Hwange area of eastern Zimbabwe. It’s close to both the animal splendour of the Hwange National Park and to Victoria Falls, one of the seven natural wonders of the world. Her village however is a world away from such natural beauty. Parched yellow fields, dry river banks and dust-blown homesteads make up the landscape. The only wonder here is how Marita and her family survive at all. “If you don’t believe in miracles, come to Zimbabwe. It’s hard to know how people cope otherwise,” said Bishop José Alberto Serrano of Hwange, the head of the local Catholic Church. “Hunger is endemic. There are a few pockets with food, while everywhere else there is nothing. And it’s just getting worse,” he said. Zimbabwe has been one of several southern African countries affected by the El Niño weather system that’s led to unusual weather patterns and 21 million people in need of food aid. 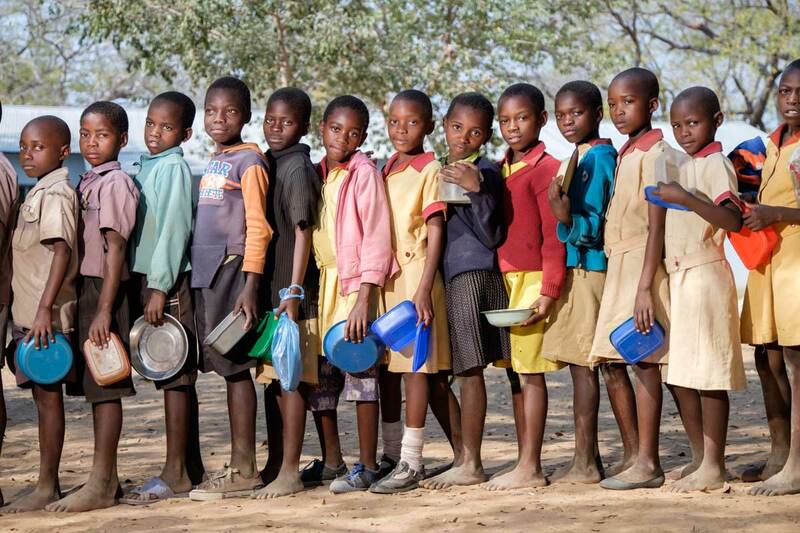 The food crisis began in Zimbabwe early in the year after two failed harvests following poor or late rains. Since then, things have deteriorated. The number of rural homes without enough food in the most drought affected areas has gone up from 30 percent in June to 79 percent in August. Over 4.5 million people will need food aid by the end of the year when the so-called lean season starts. “Without international aid, the situation will be serious,” said the bishop. An economic crisis has seen civil servants, coal miners and others go unpaid. Marita is the only adult at the moment in the family homestead. She is looking after Thoselihle, 6 years old, Anesu, 8 and Methiseli, aged 17 plus her own two children, Brilliant, aged 7 and Cute, 6. “My daughters are called Brilliant and Cute. By calling them that, I hope that’s what they become,” she said. The family has been decimated by HIV. The mothers of the other children are dead. They never knew their fathers. Methiseli is 17, but is so stunted he could be under 10 years old. The grandmother is usually around but is now seriously ill in hospital with a non-HIV related illness. Brilliant (7y)left, Cute (6y) middle, Thoselihle (6y) are eating their portion of porridge. Cute (6y) in her class. Brilliant (7y) is cleaning the classroom floor. “We don’t have any food. We depend on the government and well wishers,” said Marita. Drought and hunger have affected most rural families in Zimbabwe so there is less to share with the ones already living on the edge. The government is providing the elderly with 50 kg a month, so Marita and the children benefit from their grandmother’s ration. Methiseli doesn’t go to school. Instead he helps the family by catching mice. He can catch eight mice in a day. The mice are dried, which makes them less salty. The children also collect fruits from the bush on their way to school to supplement their diet. The children go to the nearby Mbizha primary school, where Jabulani Mkwananzi is the headmaster. Caritas is running a feeding programme in the school. Volunteers cook a mid-morning meal of corn soya blend porridge in huge vats as each pupil lines up by class, bowl in hand, to get what could be their one meal of the day. Caritas Internationalis launched an emergency appeal for the country, but there is a big shortfall. Only 42 percent of a €1.3 million programme is funded, meaning many more children are having to go without against a backdrop of the worst child malnutrition rates in 15 years. Caritas built a closer source of water in the village as part of its development programme. Caritas will also be providing cash to the poorest families via their mobile phones. A one person families will get $10, a two member households get $15, 3 member families $20 and 4 get $25. That gives them enough to buy maize, cooking oil, beans, salt and sugar for a month. Or they can use the money for other urgent needs like medicine or school fees. At the moment in Gowke, Caritas can reach hundreds via the cash distributions, but with the necessary financing that could be thousands. The children are playing and jumping around their empty grainary. Mrs Chimwanda (41y) is doing the laundry. Water is scarce. “We survive on the odd jobs that my husband can find, but that work is very rare. Mrs Chimwanda (41y) with Sinokukhanya Sibanda(37y), a Caritas community volunteer. Blonde strands of maize, made dead in the white hours of the day, lie splayed on the sun-bald ground. Here lies the remains of Mr. Taruvinga Hwami’s harvest for 2016. “The corn cobs would reach the top,” he said, now lamenting his empty granary, bare save for a few pumpkins that have seen better days. Grandfather of the seven children living with him and his wife Janet Shumbayaonda in rural Gokwe, the 65 year old farmer has seen better days too in Zimbabwe, once Africa’s breadbasket now one of its basket cases. “We rely on the rains that come through November and December, with the January rains only strengthening the plants,” he said. The November rains didn’t happen this year and by January it was all too late. “On average, we get three tonnes of maize. This year, we got 60-80 kg,” he said. Most people living off the land in rural Zimbabwe are struggling with the hunger born of drought, sharpened by failed agricultural policies, an economy in need of CPR and an adieu from hundreds of thousands of talented citizens migrating to South Africa and beyond. “The little maize we have, we give to the children,” said Janet, his wife. “If I could get work then I would, but there are no jobs. There is no work here”. Two of their grandchildren, Shepherd and Tsiti, were abandoned by their mother last year after their father died. She couldn’t cope on her own so she disappeared. Shepherd is terribly thin. His muscle failed to develop. “Bright and natural with numbers” say his grandparents, it’s an added cruelty that he is unable to walk the 6km to school. Transportation would be an impossible dream amid such poverty. Instead he stays at home. “I feed my birds. I have nine in a small birdhouse. That’s my favourite time, the time I spend with my birds,” he said. “And I can also help pick the cotton”. Like many in Gokwe, Shepherd’s family uses cotton to earn cash to pay school fees, medical bills, household items and food shortfalls. “In a regular year, we get about 13 bales. Each bale sells for $80. With that money, we send the children to school and buy things for the home,” said Taruvinga Hwami. “This year we won’t get a single full bale”. An El Niño-induced drought devastated much of the staple maize crop across the country, leaving up to 4.5 million people food insecure. “You could take a match and set fire to a field like that, it was so dry,” said Edward Hmchu, the 74 years old headman of about 30-40 villages in the Gokwe district. “All of the villages are experiencing hunger”. The people who live in his area were forced there in the 1950’s by the then British colonizers. It’s an area without a natural water supply, making farming hard even in a good year. 2016 isn’t. Stan Mahumucha, 56 years and Beauty Hove, 52 years, live in one of the villages under his administration. They’re looking after four children under 10 years old. “The government is running a food-for-work programme in which I have enrolled,” said Stan. “Our family receives 20kg of maize a month. We need 80kgs a month to survive.” They supplement their food by finding wild fruit in the forest. Their daughter, Beatrice, and her children are staying there as the husband is in South Africa looking for work. “He says he doesn’t get a plate (he doesn’t eat) so sends nothing back,” said Beatrice. South Africa’s economy is in trouble too with the plummeting rand hitting remittances to the dollar-pegged Zimbabwe. Caritas will help supplement the income of poor families in the area. A one person family will get $10, two member households get $15, three member families $20 and four person gets $25. It gives enough to buy maize, cooking oil, beans, salt and sugar for a month. It’s part of a Caritas Internationalis emergency appeal for Zimbabwe. However a 60 percent shortfall means projects like this cannot be fully implemented. In Kariyangwe, Binga District in the diocese of Hwange, they don’t bother to turn on the grinding mill for maize most days. “In a normal period, we get about 20 families per day, but this year it’s about 4 families tops,” said Fr. Philani, the parish priest. The local primary school has seen 100 of its 800 children drop out, 400 children haven’t been able to pay the $10 per term fee and the pass rate has dropped from 20 percent to 5 percent. Surprise (10) is queuing in a line to get food. Onward is a 16 years old pupil at the school. Adopted by an uncle to look after cattle, he is often absent. His clothes are held together by bits of wire. Surprise is 10 years old living with her grandmother. They survive on selling wild fruits. Arms, is 15 years, another orphan living with his grandparents. All are vulnerable, but each has their own nuance of damage. Sadly though their stories are common place. 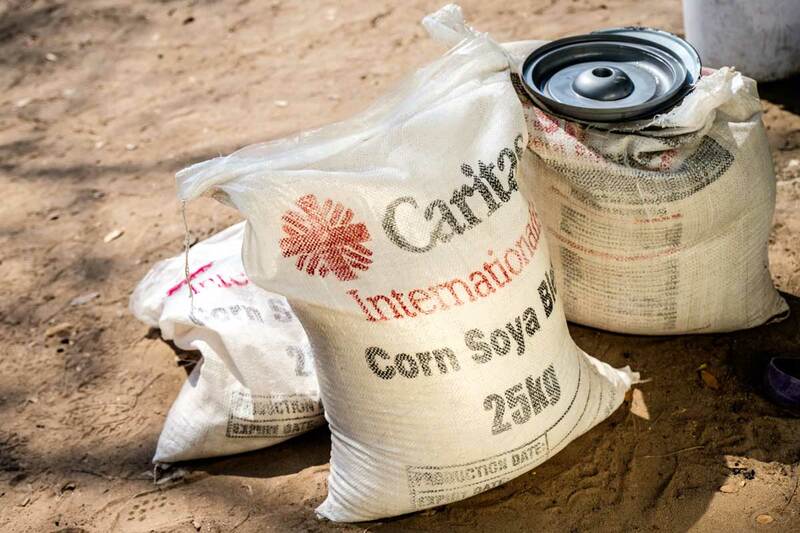 All three and all the pupils at the school benefit from a Caritas feeding programme that provides each with 0.15 kg per day of corn-soya blend porridge. “We want to give the children the energy to do their work. The feeding programme boosts attendance and boosts the pass rate,” said Michael Siansazi, the headmaster. Archbishop Alex Thomas Kaliyanil of Bulawayo, Caritas Zimbabwe president, says that the emergency work of Caritas is a crucial compliment to its longer term development programming, that includes building dams, irrigation systems and education on drought resistant crops. Children in a line to get food. 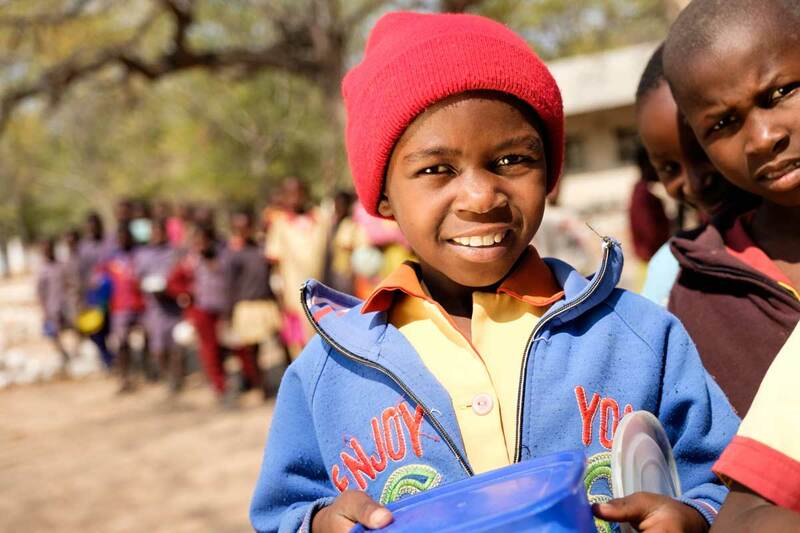 Caritas helps provide each student one meal of corn-soya blend porridge a day.